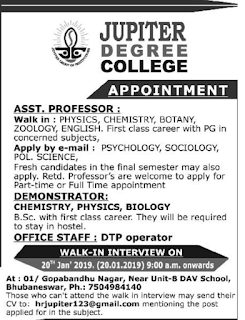 Jupiter Degree College,Bhubaneswar,Odisha has advertised for the recruitment of Teaching Faculty- Assistant Professor, Demonstrator jobs vacancies. Interested and eligible job aspirants are requested to walk-in interview on 20th January 2019. Check out further more details below. Name of the College: Jupiter Degree College, Bhubaneswar,Odisha. About College: Jupiter Degree College established in the year 2016, with a vision to impart job oriented quality education to students is widely acclaimed for the dedication, Professionalism and concerted effort of its' administrative and academic staff. The students taking admission in the college are confident of materialising thir dreams of a bright future due to the sincere endeavour and continuous monitoring of the faculty members for their all round development. B.Sc with First Class career. How to Apply: Interested and Eligible candidates are requested to walk-in 20th Jan 2019.9a.m onwards.Those who can't attend the walk in interview may send their resume to mail.